Jeremy Bentham, an 18th century utilitarian philosopher, famously asked: “The question is not ‘can they reason?’ or ‘can they talk?’ but ‘can they suffer?’” A utilitarian philosopher of our times, Peter Singer, latched into that question to write his book Animal Liberation, and so the modern animal rights movement was born. Basically, Peter Singer and many other animal rights activists claim that animals suffer like humans and therefore they should be treated like humans. Put in a more sophisticated way, Peter Singer argues that the moral imperative of equality dictates “equal consideration of interests”, that is, that the interests of all beings receive the same consideration. Animals have an interest in avoiding pain, therefore egalitarianism demands that we respect that interest. It is argued further that claiming human superiority based on our superior intelligence, our ability to talk or our culture is just stacking the cards in our favor because those are the special attributes of our species. By the same token, an elephant may claim moral superiority based on the fact of having a trunk. However, the whole argument is based on the claim that animals suffer and, moreover, that they suffer like us. Singer and the other animal rightists just assume that they do. I think this is a faulty assumption that needs to be addressed head-on, but I understand why they take umbrage in it: the whole problem of defining suffering seems intractable at first sight. ‘Suffering’, like ‘happiness’ and ‘consciousness’, belong to a class of concepts that are at the same time abstract and fundamental, so that defining them in terms that are non-circular seems nearly impossible. If you look at dictionary definitions of ‘suffering’ you will find that they refer to pain, unpleasantness or perceptions of threat, which are just synonyms or examples of suffering. This does not represent a problem when the idea of suffering is applied to human beings, because we can get accurate descriptions of their suffering from other people. However, when we want to apply this concept to animals we need a clear idea of what we are talking about, otherwise we risk falling into one of two opposite pitfalls: self-serving callousness -choosing to think that animals do not suffer because this is convenient for us; and anthropomorphizing – thinking an animal suffers just because we would suffer if they did that same thing to us. The latter feels intuitively true because is based on empathy, a very powerful human emotion. However, it is not a rational conclusion. Do all animals suffer? Do all animals suffer equally? Just like in the case of happiness and consciousness, the problem of suffering can be studied scientifically. In fact, there are a lot of scientific studies related to suffering because one important thing the public demand from scientists is to find solutions to pain and other forms of distress. Just like in the case of happiness and consciousness, science may not have come up (yet) with a complete description of suffering, but it certainly can tell us a lot of things about it. I think that this information can help us form an educated opinion about whether some particular animal suffers or not. Most people would agree with the idea that not all living beings suffer. One of the most peculiar things about life is that it seems goal-directed: living beings strive towards keeping themselves alive and making more beings like them. However, this does not imply any form of consciousness or intentionality; it is just something that living beings do automatically because otherwise they wouldn’t be living anymore. It is important to underline this fact because this striving to stay alive can be easily confused with the “interest” that Peter Singer talks about. Yes, life perpetuates itself, but that doesn’t mean that living beings are conscious or that they have interests and plans like we do. To think otherwise would be to accept some magical vitalist concept of life that science rejected long ago. Therefore, we can conclude that plants do not suffer, although they grow, reproduce and even fight their enemies with chemical responses. Likewise, we should accept that animals that lack a nervous system (like sponges) or that have only a rudimentary nervous system (like worms) do not suffer. What about animals that do have a complex nervous system? Do they suffer? Here we must consider that suffering and pain are often confused, but in fact are not identical. Pain produces suffering, but suffering can be produced by things other than pain, generally speaking by negative emotional states. That pain and suffering are not identical is also shown by the fact that people may experience pain and not suffer from it. For example, the pain experienced when practicing some sports, when eating spicy food and by sexual masochists induces positive feelings instead of suffering. Some drugs called dissociative anesthetics (like ketamine) can selectively turn off the emotional part of pain leaving intact its sensory component: we are still able to feel the pain, but just don’t care about it. Given the complexity of this subject, I chose to divide this discussion into two parts: suffering that comes from physical pain and emotional suffering. I will start with the first. Pain scientists distinguish between three concepts: nociception, pain and suffering. This distinction is even recognized by the Humane Society of the United States, an animal rights organization. To understand nociception consider the case of a patient who is undergoing surgery under general anesthesia. As the skin and organs of this person are being cut, pain sensory nerves faithfully record the damage and send this information to the spinal cord, which continues to the brain. The normal traffic of noxious signals only stop at the cerebral cortex because the large parts of the brain cortex is turned off by the general anesthetic [1, 2]. This basic processing of noxious information is what we call nociception. Of course, in an awake person nociception leads to pain. The important idea, however, is that the processing of information concerning physiological damage involving millions of neurons and sophisticated neural pathways does not imply the existence of pain. In fact, nowadays pain is considered part sensation part emotion; because fundamental aspects of pain are its negative valence (we dislike it) and its salience (we cannot avoid paying attention to it). Pain requires a fairly complex nervous system capable of turning sensations into emotions. Based on these ideas, I think it is reasonable to infer that animals that lack a nervous system of enough complexity do not feel pain, they just have nociception. Behavior consisting in avoiding a noxious stimulus should not necessarily be taken as an indication of pain. After all, even plants react to noxious stimuli. It is difficult to draw the line between animals that have just nociception and those that experience pain. However, it is clear that many animals do not come even close to having a nervous system complex enough to produce the sensation of pain with its associated negative emotions. Animals like the pond snail (11,000 neurons) or the sea slug (28,000 neurons) just don’t have this capacity. By comparison, we have 100 millions neurons just in our gut (the enteric nervous system) and 86 billion neurons in our brain. 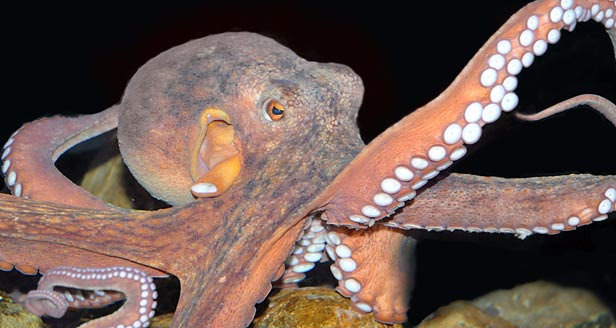 Of the invertebrates, the only animal that comes close is the octopus, with 300 million neurons, comparable with the rat’s 200 million neurons. This is why countries like the UK and Canada now give cephalopods (octopi, squids and cuttlefish) the same protections given to vertebrates. Of course, the number of neurons is not the only metric to measure the complexity of a nervous system, but using other metrics like number of synapses or overall capacity to process information will give similar results. A table of the number of neurons in different animal species can be found here. But what most people are concerned about are the most complex animals, the mammals and the birds, which we eat, have as pets and use in scientific research. What about them? Do they feel pain? Do they suffer? A lot can be learned about the relationship between pain and suffering in mammals by studying brain areas involved in the processing of pain in the brain. As I indicated above, pain has a sensory aspect and an emotional aspect. The sensory aspect of pain is processed by the somatosensory cortex, an area shaped like a hairband going from the top to the sides of the brain. It contains a detailed map of the body and processes pain and touch, telling us where these sensations originate (nowadays it is recognized that the dorsal posterior insula also contains a map of the body and is responsible for judgements on the localizations and intensity of pain). The somatosensory cortex is connected to the orbitofrontal cortex, located at the front end of the brain and whose function is to plan actions according with the information it receives. But neither the somatosensory nor the orbitofrontal cortex are responsible for the emotional component of pain. This function is assigned to two other areas of the cortex: the insula and the anterior cingulate cortex (ACC). Generally speaking, the function of the insula is to tell us how bad pain feels and to associate that emotion with a host of other emotions like sadness, fear, anger, joy, disgust and pleasure. Emotions can be understood as motivational states of the brain: they predispose us to act in a certain way, organizing everything we feel in a hierarchical way according to what we need to do. Pain is an emotion that motivates us to stop or escape from whatever is hurting us. This urgent motivational aspect of pain is processed by the ACC. So we could say that the insula and the ACC work together to turn pain into suffering by giving it its “I don’t like it” and “I want to stop it” qualities. Recent discoveries have revealed that during the evolution of primates (monkeys, apes and humans) there was a reconfiguration of the brain pathways that process pain, culminating with the appearance of completely new pain processing areas in the human brain [2, 3]. To convey the importance of these changes, I must quickly summarize the neural pathways that carry pain signals from the body to the cerebral cortex. 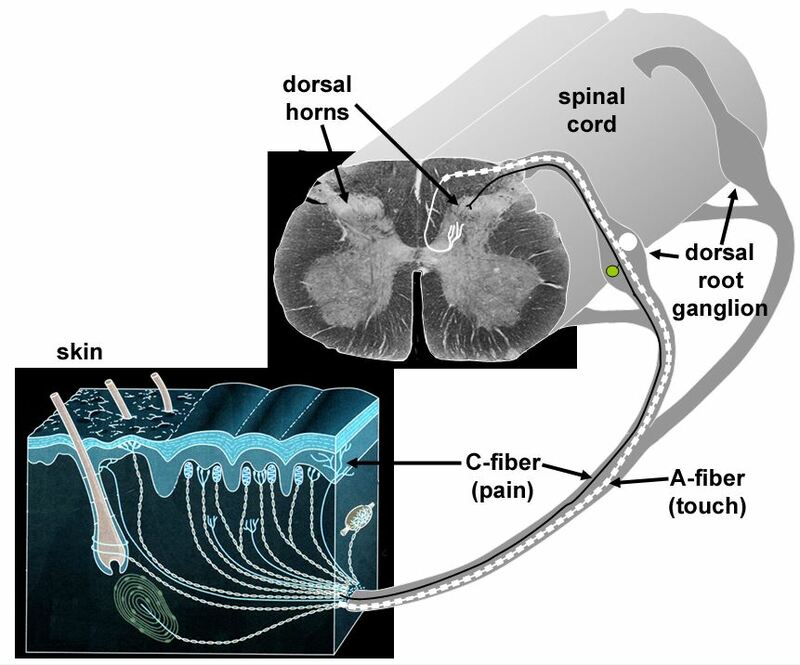 Noxious signals are carried by specialized fibers in the nerves from any part of the body to the dorsal horn of the spinal cord (see figure below). From there, the signals travel to the parabrachial nucleus in the brain stem, where they branch out to different nuclei of the thalamus and the forebrain . Located in the middle of the brain, the thalamus function as the central relay of all sensory information, with its different parts or nuclei handling visual, auditory, gustatory, tactile and pain information. Different thalamic nuclei send pain signals to the four areas of the cortex described above: the somatosensory cortex, the orbitofrontal cortex, the insula and the ACC. These pain pathways are present in all mammals, but in primates a new additional pathway emerged that directly links the spinal cord with the nucleus of the thalamus connected to the insula, bypassing the parabrachial nucleus. This means that pain sensations are able to directly reach the part of the cortex where feelings are created. In humans, the size of this direct pathway between the thalamus and the insula is much larger anatomically, and much larger and more complex than in monkeys. But is there another change in the brain that is unique to humans and a small number of other species including elephants and cetaeceans, but not being found in monkeys: a new part of the insula called the anterior insula [4, 5]. A.D. Craig, a scientist who has studied these changes by mapping the brains of monkeys, apes and humans, thinks that the posterior insula serves to create an emotional map of the state of the body in each moment. The anterior insula, on the other hand, serves to model the state of the body as it was in the past or in hypothetical situations in the future: “if this were to happen, that’s what I would feel”. Craig thinks that this gives us self-awareness by modeling feelings that represent the interior state of the body through time. The representation of hypothetical states of the body performed by the anterior insula is probably also responsible for empathy, the ability to feel what another person is feeling by simulating his body state in our own brain. In relation to suffering, we can see how growing relevance of the insula in generating the negative emotions associated with pain progressively increase the depth of suffering. This process culminates with humans; we are not only able to experience the pain of the present but are also aware of ourselves as beings that have suffered in the past and that may suffer in the future. Animals that lack an anterior insula would not be able to experience this type of suffering. The gradual appearance of the anterior insula in apes like bonobos and chimpanzees seems to correlate with the development of empathy and positive social emotions [4, 6]. In summary, we need to take a gradualist approach when considering the presence of pain and suffering in animals. Invertebrates, with the possible exception of cephalopods, do not appear to have a nervous system complex enough to feel pain, let alone suffering. Their behavior can be explained by simple responses to nociceptive signals. Vertebrates, particularly the ones with highly complex nervous systems like mammals and birds, do experience pain and quite probably suffer from it. However, the deep suffering that we experience as humans beings, rooted in our memory and our capacity to imagine the future, does not seem to exist other than in a rudimentary form in other mammals. Although animals have memories, without an anterior insula they cannot use them to construct a vivid representation of their past suffering, like we do. A measure of self-awareness and deep suffering exists in elephants and cetaceans, which also have a highly developed anterior insula and ACC with von Economo neurons. Jeremy Bentham and Peter Singer failed to understand the true nature of suffering when they came up with the idea of speciesism. Just like we do not give the same moral status to animals and plants, we cannot give the same moral status to all animal species. When deciding how we should treat them we need to take into consideration whether they can feel pain and, if they do, how they suffer from that pain. The suffering of a mouse, a dog, a monkey and a chimpanzee are not equivalent. By the same token, human suffering has to be given a higher ethical consideration than the suffering of other animals. There is a moral imperative to diminish suffering in all sentient beings, but when difficult choices have to be made, human suffering has to come first. If saying this makes me a speciecist, I will wear that label with pride. But I’d rather call myself a humanist, because for me the priority is to decrease human suffering. Craig, A.D., Topographically organized projection to posterior insular cortex from the posterior portion of the ventral medial nucleus in the long-tailed macaque monkey. J Comp Neurol, 2014. 522(1): p. 36-63. Craig, A.D., The sentient self. Brain Struct Funct, 2010. 214(5-6): p. 563-77. Craig, A.D., Interoception: the sense of the physiological condition of the body. Current Opinion in Neurobiology, 2003. 13(4): p. 500-505. Bauernfeind, A.L., et al., A volumetric comparison of the insular cortex and its subregions in primates. J Hum Evol, 2013. 64(4): p. 263-79. Craig, A.D., Significance of the insula for the evolution of human awareness of feelings from the body. Ann N Y Acad Sci, 2011. 1225: p. 72-82. Rilling, J.K., et al., Differences between chimpanzees and bonobos in neural systems supporting social cognition. Soc Cogn Affect Neurosci, 2012. 7(4): p. 369-79. 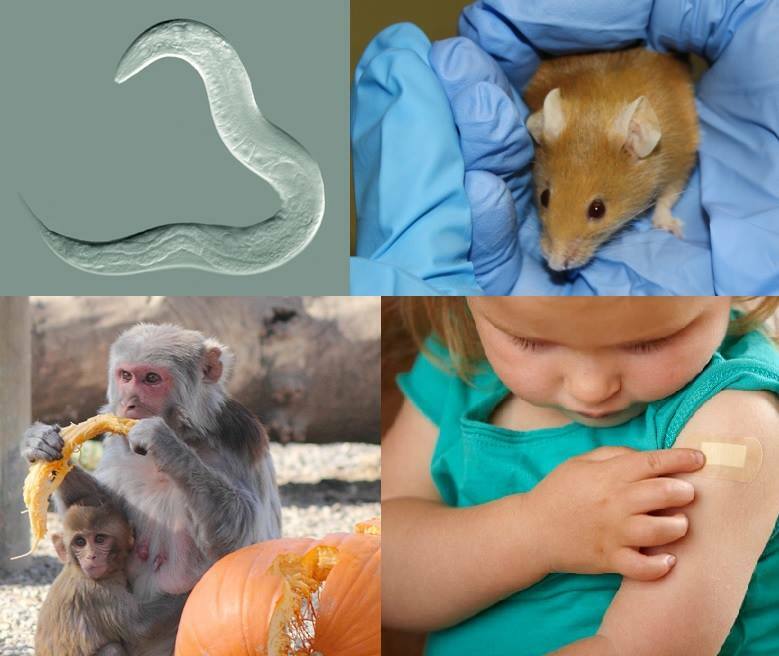 Posted on January 12, 2015 January 13, 2015 by EditorPosted in News, Philosophy, Science NewsTagged animal research pain, animal testing pain, animal testing suffering, Do animals suffer?, nociception. 1. You mention that the “clear justification of the moral superiority of humans has not [been] clearly formulated”, and that this formulation is your “long term goal”. To me that seems to indicate that the raison d’etre of your theories and arguments (i.e. the moral superiority of humans) is actually non-existing (so far). Am I wrong? 2. I agree with you that it be highly unlikely that the depth in the experience of being human would ever be present in a pig, meaning that a pig will never be able to experience what it is like being a human. In the same way you and I will never be able to experience the depth in the experience of being a pig. Me may fantasize about it based on anthropomorphizing or measures of neurons, but we will never be able to actually experience it. This means that – whatever basis we may come up with – we will never really know if the pig is suffering or not, we can only suppose. And what we suppose is, as you say, value-based (including our definition of suffering). Value-based, I would argue, in reality means ‘totally arbitrary’. Do you claim there to be some non-arbitrary way to determine whether a non-human being is suffering or not? So what is your opinion of research showing that many animals such as rats have cognitive biases and episodic like memory? Do these experiments have any implications for you about how we should view animal suffering? I appreciate that you are willing to discuss everyone’s concerns. I was just pointing out the hypocrisy of this website in relation to your article because the website is justifying the use of animals because of their similarity to humans – and never admits any times where animal research can be misleading. Just because I am a former animal researcher who started questioning data collection techniques and the confounding factors of stress does not make me an animal rights activist. Rather, it makes me a caring scientist who isn’t blinded by the dogma that animal research is good all of the time and there is nothing better out there. Yeah but you also talk about the “dignity of the human body” which makes it immoral to harm it even when it does not experience pain or suffering. This has nothing to do with the “emergent properties” that you mention. I happen to agree with you that dogs, for example, can tolerate a lot more pain than humans can. That is one thing that I’ve always admired about dogs! But that doesn’t make it ok for us to smack them in the head, just because it bothers them less than it would bother us. As for your goal, if we humans want to prove our “moral superiority” to other species, the best way to do that is by treating all living beings with kindness, consideration, and respect. It must be nice to work with birds and mammals in the field, although you don’t describe exactly what you do. Your observations seems to be based solely on your own emotional reaction to the behavior of those animals and therefore have little scientific validity. Most animals, even plants, react strongly to noxious stimuli, but whether this represents pain as we feel it or just an automatic reaction is not a simple question to answer. For sure, it has been know since the time of Darwin that mammals experience sadness, joy and other basic emotions. What I’m arguing here is that self-aware humans experience suffering and happiness with a depth which is absent in most other mammals. The question posed by “Former Animal Researcher” reflects a tactic often used by animal rights activists: when they cannot argue against a particular line of reasoning or evidence they shift the discussion to an unrelated topic. The topic of my article is whether animals suffer, but the commenter wants to discuss the utility of animal research. If my article was on the utility of animal research, I’m sure that he would argue that animals suffer and therefore nothing at all could justify their use in research. I’m just not going to play along with these deceitful tactics. Then you accuse me of “giving comfort and aid to creationists”. This is a fallacy of arguing from adverse consequences. My ideas should stand or fall on their own, independently of what the do to the creationist debate. I am an atheist, so obviously I do not support creationist. Still, it is worthwhile to consider this issue in depth. It is true that Christianity and other religions established a belief that humans were superior to animals. With the theory of evolution, some people got the idea that humans are “just” animals and therefore animals and humans should be treated the same way. Most people find this idea repulsive, but it is true that a clear justification for the moral superiority of humans has not clearly formulated. You are right that this is my long-term goal. I believe that we humans have emergent properties that put us in a different category than the rest of the animals, including self-awareness, a host of human-specific emotions and the ability to acquire and transmit a complex cultural “software”. Put together, these emergent properties gives the experience of being human a depth that is not present in animals. This is a purely naturalist argument, independent of any religious belief, but of course value-based. You close with the usual “humans are bad, animals are good” line often used by animal rightists. No doubt you are very proud of your misanthropy. I knew when I read your essay that you were a laboratory biologist. I spent 17 years on an Institutional Animal Care and Use Committee. Often I was the only field biologist on the committee so i got to watch many a lab scientist make similar arguments, often when they wanted to do something like decapitate a conscious rat. I have worked on thousands of mammals and birds in the field and i can assure you that they experience pain and suffering pretty much in the same way humans do. You are hiding in a semantic crack by trying to separate pain from suffering, when I think everyone knows they are strongly linked, i.e. if you feel pain you are suffering. I have watched birds and nonhuman mammals grieve when they lose a mate, a parent, or an offspring. I cannot state that they were aware that they were suffering, but they acted exactly the way a human would under the circumstances. Your dodging of the animal research question the last commentator asked you reveals more than you think. There is one thing I want you to consider that i have pointed out to numerous laboratory scientists over the years. That is the arguments you make are very similar to those that emerge from a creationist perspective, i.e. you want humans to be distinct from all other species on the planet so you try hard to find some thing, even if it is a difference of quantity rather than quality. Arguments like yours give comfort and aid to creationists because they want humans to be ‘specially created”, which means every distinct trait they find is a new weapon in their armory. Maybe you should consider that most nonhumans are simply tougher than most humans, also that there is no selective benefit to carrying on and acting in a histrionic fashion when you are injured or undergoing mental stress. Humans, especially well off humans, are the only ones who have the free time and safety to indulge themselves. You are making an entirely different point that I addressed in another article on this website. Please direct your comment on the utility of animal research to that article. I will be glad to answer any comments you may have on the subject of this article, which is the ability of different animals to feel pain and to suffer. Wholeheartedly justifying animal research is necessary because of their close similarities to humans is anthropomorphism at its finest. This anthropomorphism blinds you from admitting there are setbacks to animal research and it can lead to human harm (e.g. drug development human deaths after drugs were tested on several species of animals, etc). This mentality also prevents us from developing alternatives – because you will always argue there will need to be a whole body system – but if it is misleading sometimes, then it is not advancing science–it is harming it. Instead, you choose to blame activism when they talk of animals feeling pain, etc in response to your stressful research procedures–all while you justify testing on animals because they are so close to us. You can’t have it both ways. —A little admission about the negative sides of animal research would be appreciated so we can actually move forward with the 3Rs. I am a former animal researcher and had to resign because I stopped trusting the cherry picking of data that went on at the animals’ expense only to produce some shady articles to keep salaries going. Very sad that students are looking up to people like this — and they are learning to be insensitive to animals to boot. … After all, the Supreme Court decided to give rights to corporations, who do not suffer and are less conscious than animals, and we are stuck with that decision. I googled “gork” and it seems to be slang expression to designate brain-dead patients. Yes, I agree that using them for things that they have not consented would be unethical. This would be based on the dignity of the human body and not on their capacity to suffer. It is a similar case than using organs for donation or cadavers for dissection without the consent of the patient or his/her family. However, in your previous post you mentioned “patients who actually get pleasure from self-injury”. These seem to be quite different from gorks, so I beg you to be patient with my misunderstanding. As for the other issue, you seem to confuse “moral status” with “animal rights”. My position is that of “animal welfare”, so I believe that animals have moral status and deserve to be treated with respect and their suffering minimized. I don’t think animals should be given rights. However, if we (as a nation) decided to assign rights to an animal species, we could do so and then they would have rights. It’s a political decision with which I would not agree but that I would obey. Heh. Well now this is funny. You say that humans have the right to assign moral status to different beings, yet we can’t assign rights to species other than our own. Ok then, we can assign “moral status” to elephants and cetaceans, based on their scientifically proven “measure of self- awareness and deep suffering” (your own words) which prohibits keeping them in captivity. While I think we should prevent the suffering of elephants, cetaceans and apes, I do not think that they have rights because for a being to have rights it should also have responsibilities and the ability to understand those rights. I’m not going to argue marginal cases here. As for your second point, I already explained in my article that we should not confuse pain and suffering. Babies do feel pain and there are now ways to identify pain in young infants based on their face expressions. People may choose to self-inflict pain and I believe that they have a right to do so as long as they don’t injure themselves seriously. In fact, an excessive fear of pain can be unhealthy. Anybody who practices a sport knows that they have to learn to tolerate and even welcome a certain amount of pain. The information presented in this article certainly supports the idea of “animal rights” for elephants, chimpanzees, and cetaceans, whose capacity for suffering is close to our own. Not full-blown human rights, but a lesser level of animal rights, like perhaps the right to swim free in the ocean for cetaceans who are suffering in tanks at amusement parks. However, I’m not so sure that capacity for suffering should be our only guideline. As a pediatric psychiatrist, I’ve seen many patients who “don’t seem to feel pain,” according to their mothers, and other patients who actually get pleasure from self-injury. But I don’t think anyone would find it morally acceptable to physically hurt to these people against their will, simply because they don’t suffer as a result. Trying to provide objective parameters for these issues always falls short. The “we”, obviously, is we humans, since animals are incapable of making moral judgments. And since we humans are the ones that brought morality into the world, that is what gives us the right to assign moral status to different beings. Someone that believes in God could think differently, of course, but I don’t. And what if an animal felt no pain. Does that make it acceptable to deprive it of life for our gain? Of course! The same way that we have no problem with plucking a plant off the ground and eat it. And who is the “we” that feels entitled to assign this lower moral status and by whom or what authority have “we” been given the right to assign a moral status to another? And what if an animal felt no pain. Does that make it acceptable to deprive it of life for our gain? Seen this way, your entire argument although very elegant is irrelevant. It is an argument and construct fabricated for the convenience of man.